Have been going for some of the screenings at the ongoing European Union Film Festival (schedule here if you’re a Delhiite: it’s on till Friday) and most of it has been good. For starters, the Siri Fort Auditorium authorities have been a lot more polite and pragmatic than on past occasions (some of my earlier rants here and here). They aren’t doing silly things like not allowing cellphones in – the guards simply instruct everyone to turn the volume down, and astonishingly it appears to have worked: in the four screenings I’ve been to so far, only once have I heard a phone ringing in the hall, and even that was cut off almost immediately. At the festival inauguration on Friday a profoundly bearded Vinod Khanna, looking like a yeti in a smart suit, made a short, impromptu speech about his days as a film student: “I’ve never learnt as much about other countries as when I was watching movies from around the world in the early 1960s.” Barbara Gräftner and Andrea Nürnberger, the director and lead actress respectively of the opening film My Russia were also present and quite thrilled to see how appreciative the crowd was. I sometimes scoff at much-too-earnest film festival types waiting around for hours outside auditoria discussing films in the most portentous ways, but these events can be very charming in small doses. I enjoy the bonhomie, the small-scaleness of things, and the fact that most of it is free or nominally priced (just a couple of days earlier I’d had to back out of a multiplex screening where tickets had already been booked online – which meant Rs 300 thrown away. It didn’t make me happy). There are no tedious preludes to the screening of any of these films, no long-winded commercials. One of the staff members simply comes up to the stage at exactly the right time, makes a quick and tentative introduction (invariably mispronouncing names) and then the screening begins, just like that. Of course, there will always be little annoyances: an old man will definitely start snoring loudly in the row behind you exactly 10 minutes after the film has begun, and at every second screening a scruffy, sweat-soaked creature will turn to you and ask meaningfully, “Bhai saab, iss film mein koi scenes hain?” These things are as inevitable as the loud boor on the flight demanding a whisky with soda every 15 minutes. But you learn to take these things in your stride. It helps when the films are good. 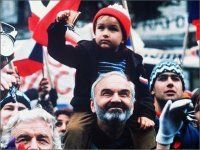 I loved Kolya, which won the foreign-language film Oscar in 1997. Had heard of it before (in part because of an apocryphal story from that time, about Shah Rukh Khan being woken up and told that his film Koyla had won an Oscar!) but I wasn’t prepared for something so powerful and moving. It’s set in Russia-occupied Prague in 1988 and the central character is a middle-aged lothario named Louka, a professional cellist who agrees to a temporary “marriage of convenience” with a Russian lady seeking Czech citizenship – Louka, struggling under the weight of numerous debts and holding down two jobs, goes along with it because he badly needs the money. But then the woman rushes off with her lover and Louka, who’s a bit of a misanthrope, finds himself in charge of her five-year-old son Kolya. The story is about the development of the relationship between him and the boy, and how the initially unwelcome responsibility reveals a side to his character even he was unaware of. Other films seen: La Femme de Gilles (the tone of which reminded me of some of Claude Chabrol’s work) and Mike Leigh’s Topsy Turvy, which I’ll blog about later if time. Kolya is a nice film but it is interesting that you approvingly mention that it never brings politics to the forefront because I thought that was where it failed. I don't want a clearcut political message in a film but without bringing the political context in sufficient detail this just becomes any other story. I don't want to downplay the "universalistic" or "humanistic" side (although I do find them cliched many times) of the film but you have to give specifics of the story and the context the importance it deserves. Vinod Khanna attended film school? Where, how? Given the short shrift given to foreign films at the Oscars (no clips, just postar montages), I sometimes yearn for the wide-eyed sincere curiosity that we seem to have towards foreign films in India. At least our film students are encouraged to look at films made in other nations for cinematic education. Here, in some of the best film schools in the US, foreign cinema is expendable, because everyone is so technology-obsessed that no on cares about narratives anymore. Alok: while Kolya didn't bring politics to the forefront, that isn't the same thing as not providing a political context at all. I thought it did provide the context but kept the focus on the things it considered more important. Not giving politics too much importance was part of the film's point about humanity overriding nationalistic concerns. Swati: He didn't specify what school but he mentioned how watching Polanski's Knife in the Water had a huge effect on him in the early 1960s - even though it wasn't subtitled and he didn't understand the language. I am a bit surprised to see that mobile phones are usually allowed in India. Doesn't it irritate you when people talk through the movie?! I have to say that I am all in favour of cinemas jamming signals to mobiles so nothing gets through. I cannot imagine getting to a tense piece of drama and then some "comdedy" ringtone going off! Bina: of course it irritates me when people talk on their phones while a movie is on. But not allowing cellphones into halls isn't the solution - unless the organisers are also willing to provide hundreds of lockers to keep them in. What about the people who don't have their own vehicles to leave the things in (not that that's a safe option either)? Jamming signals would be a good solution. But the ideal thing would be if people just learnt how to switch the instruments (or at least the volume) off. So people don't just turn them off?! I am really surprised. Maybe the solution is to have strict staff members who eject viewers who receive a call. You lose the money you paid for the ticket, and hopefully that will deter the offenders from keeping a phone on. Any thoughts on Brokeback by the way? 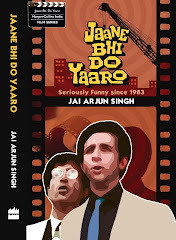 I am interested to hear about the reception of such an overtly gay themed movie in India. Thalassa Mikra: You said, "Here, in some of the best film schools in the US, foreign cinema is expendable, because everyone is so technology-obsessed that no on cares about narratives anymore." Besides, three quarters of the questions would have been stupid. Those are the kinds of questions they are educated to ask. I remember when I was lecturing in the US I'd spot a girl who looked prety and address myself to her, as I find talking directly to one person rather than to a group helps me speak. then she'd formulate a long sentence: 'Mr Godard, do you blah blah blah' floowed by 'can you elaborate?' And I'd just been elaborating for an hour. So anyway, I'd start to elaborate further only to look up to see she's picked up her file and is leaving. I don't know what your students are like, but I have my suspicions. So that's Godard. I have to say, it's not that much better here, in India. yes, there are great films, but those are from a couple of decades ago. Film students think Tarkovsky is the last great film maker. Of course, they don't ask clever, long questions. But that could be because they rarely attend lectures. in the theatre that i used to work before, we have a set of volunteers every evening inside the audi - before, during and after the shows, to mainly monitor mobile use and unnecessary movements. live performances are very tricky. so we strictly allowed no latecomers and mobile use was a BIG NO. the volunteers would individually go to anybody fiddling with their cell inside the audi right before the show and request him/her not to use it during the show. if the same person insist on using it during the show, the volunteer would sit next to him/her and quietly make sure s/he doesn't touch the cell. outta embarassment, s/he would quietly watch the show or leave the audi. it worked during our first theatre fest and its known in bangalore that ranga shankara is very strict about latecomers and mobile users. the organisers have to take it upon themselves to really educate audience on theatre etiquette. extending the same practice to cinema, collective chaos' volunteers out here makes sure that the audience do not use mobiles during the show. and it works here. i watched 'kolya' last year. i would ideally prefer best foreign film academy award winner to be 'foreign' to hollywood film-making. 'kolya' proved it is not so. i came back with images of some very clever scenes, and nothing much. never been to such screenings ....you might find it strange asking me this but do they run subtitles thrughout the movie? Mayank: that is a strange question, to be honest. Did you really think I know all those languages?